Apple with a single sentence in an interview has acknowledged the existence of external graphic processing units —and continues to not put more than casual blocks in place to prevent them from functioning. In an interview that revealed Apple's future intent for the Mac Pro, the evolution of the iMac, and the continuation of the Mac mini, Apple Senior Vice President of Software Engineering Craig Federighi responded to a question about external Thunderbolt GPUs. Simply, Federighi said that "I think they have a place" —and nothing else. Federighi's remark is carefully crafted, and doesn't explicitly say that Apple is working on the concept, and Apple's actions are only slightly more clear. 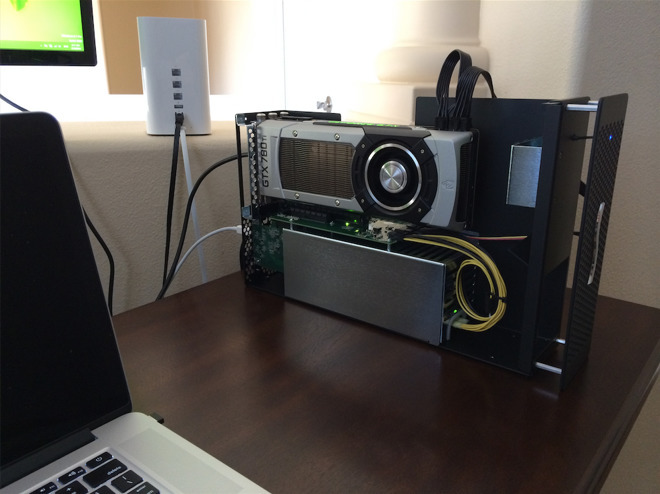 During the development of the Thunderbolt 3 protocol, the ability to seamlessly interface with a GPU in an external PCI-E breakout box was added, rather than it just being a hack. While explicit support would be good for users, what Apple could produce in the field would be far better. An external GPU in practice releases the user from the shackles of lower-performing GPUs typically found in a laptop, and allows the user to leverage desktop PCI-E cards in an external enclosure, benefitting from both an improvement in thermal conditions, as well as no limitations on consumed energy. At present, every macOS 10.12 Sierra release breaks compatibility on two fronts, by erasing previous changes, and necessitating a new GPU driver. After a new driver is available, the re-installation procedure is still relatively simple, involving disabling System Integrity Protection, and a third-party script execution to install the compatible driver. If Apple chose, it could do much more to block external GPU construction. Other than the surmountable road-blocks in place, it has not chosen to do so. Our own work continues, vendors continue to crank out new enclosure designs, and several other groups of enthusiasts are making great progress to a "plug and play" solution —but it's not there yet. The only way to make eGPU a tool for the masses is for Apple to explicitly support the technology, rather than just not utterly disallowing it. 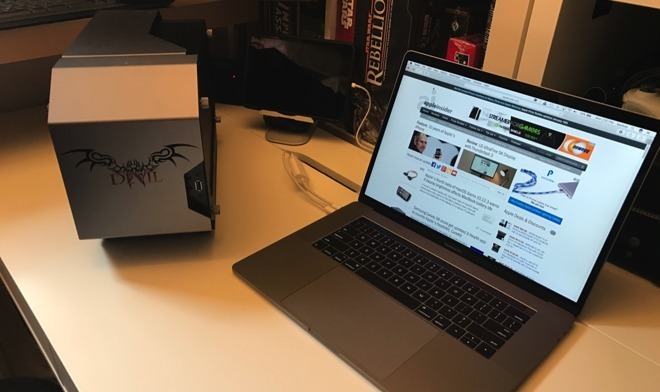 Where eGPU hacks stand now is where Windows installations stood before Apple released Boot Camp —doable, but only for the dedicated. Possibly, given Apple's uncharacteristic candor on Tuesday about the rest of the Mac product line, and nearly nothing to say about eGPU technology, there's something in the works. While explicit support would be good for users, what Apple could produce in the field would be far better.